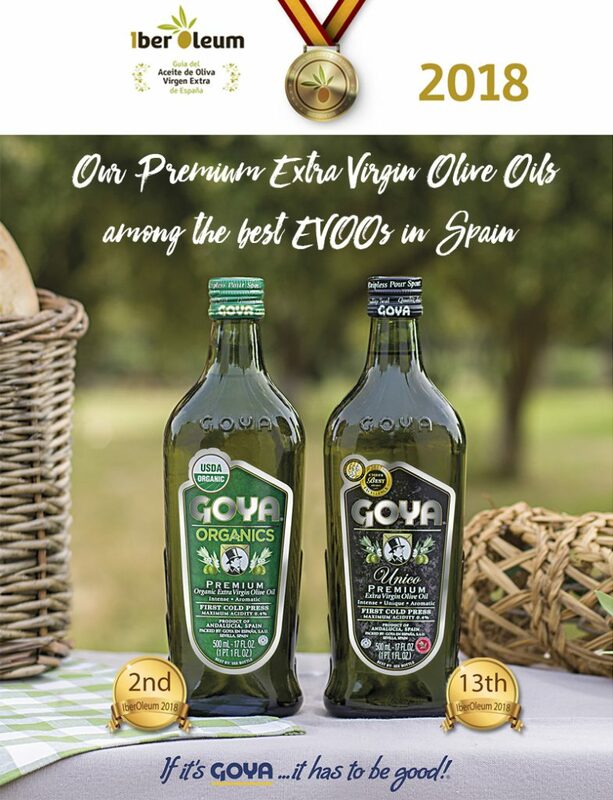 GOYA® Premium Extra Virgin Olive Oils continue to win awards at national and international competitions. Thus, they have been recognized among the Top 15 best EVOOs in Spain according to the third edition of IberOleum Guide . In it, the GOYA® Organics Extra Virgin Olive Oil ranks 2nd place, with a total of 95.5 points. Likewise, GOYA® “Único” Extra Virgin Olive Oil, ranks thirteenth place with a total of 91.1 points. In the third edition of IberOleum Guide held last February at Baeza, the organoleptic evaluations of more than 150 extra virgin olive oils from all over Spain submitted to the contest have been carried out. In this edition, a presentation system has been followed in room to the tasters of the olive oils one by one, guaranteeing the maximum concentration in the evaluation of the same with more reliable results. These awards recognize the effort of Goya Spain offering premium gourmet EVOOs with taste and tradition as their main values. GOYA® Organics Extra Virgin Olive Oil is a blend of the Picual, Hojiblanca and Picuda varieties which guarantee an extraordinary sensory experience: an intense fruity green aroma, with notes of herbs and green leaves, hints of tomato, apple, green almonds and artichokes, a balance between a bitter and peppery taste on the palate, harmonious and elegant. GOYA® “Único” Extra Virgin Olive Oil is the culmination of an exhaustive and rigorous inspection from tree to table. Its origin draws from the careful selection of the Hojiblanca and Picuda olive varieties prepared using the first cold press of the olives, a few short hours after being harvested, in order to preserve each and every one of their magnificent organoleptic properties.